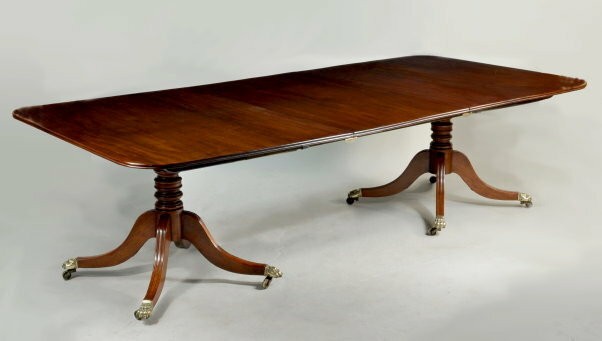 Very fine period regency figured mahogany two pillar dining table, with double reeded edge tipping tops above baluster and ring turned columns, set on four arched molded legs ending in brass paw casters. England, circa 1815-1820. 50" wide, 76" long, 103" long with one 27" original leaf, 28 1/2" high. All Images and Text © Thomas Schwenke, Inc. 2001-2014.